Pick it up at your local record store or download it now at one of the stores below. 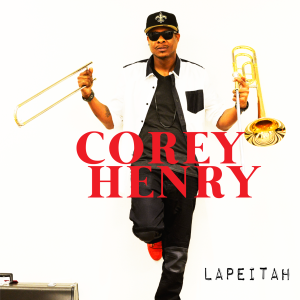 Co-p roduced by Corey Henry and Pimps of Joytime’s Brian J, “Lapeitah” places Henry on the national stage, revealing the signature playing style developed in the heart of the Treme. The Brooklyn-meets-New Orleans collaboration is a mixed genre tour de force, representing the best that funk, soul, rock, and jam-based music have to offer. Among the many special guests you’ll find are Living Color’s Corey Glover, Greg Thomas of George Clinton & Parliament/Funkadelic, and Maurice “Mobetta” Brown. Offbeat Magazine’s 2015 and 2018 Record Label of the Year and home to Louisiana super groups like Ivan Neville’s Dumpstaphunk and Honey Island Swamp Band, Louisiana Red Hot Records is a leader among Southern independent labels in marketing and worldwide distribution. Louisiana Red Hot has emerged from the near-total destruction of its facilities by Hurricane Katrina to become the only label in the Deep South partnered with Entertainment One, the world’s #1 independent distributor of music and video. For over 20 years, Louisiana Red Hot Records has specialized in providing the world with a richly varied catalog of more than 200 albums by a brilliant array of Pelican State blues, jazz, rock, R&B, Cajun and zydeco artists. The company continues to represent the best of the past and future of music made in and inspired by the profound and incomparable Louisiana musical heritage.